Please leave me a testimonial below! Well, my journey started in October 23rd 2013 at Best Start and I was excited to try a water birth rather then going to the hospital. I went a full 2 weeks (full term) after my due date and had to take castor oil to get me started with contractions and I tell you what, it worked and the castor oil came on quick and strong. Took an hour from Murrieta to San Diego. That felt like the longest ride of my life! When I got to best start I tried to deal with the Contractions but they were too strong and painful . I unfortunately had to transfer from best start to the hospital because I needed a epidural. I was really sad about that. Well I think it was 18 hours later I gave birth naturally, which I was happy about that at least! We had our cooler with ice and the placenta in a bag ready for Trisha to come pick up. With no hesitation she came real quickly and took my placenta for prepping. She came later and surprised me with the umbilical cord dehydrated and shaped into a heart which made me tear up with joy, that was special to me! Then a pressed picture of the placenta whole on paper, that was cool and interesting. And I got a tincture as well! Trisha and her expertise with placenta encapsulation did me well. Taking the placenta helped me come back to earth after giving birth and I didn’t feel lack of nutrition and hormones cause I was able to get all of it back inside of me and plus made me lots of milk for my baby. And I probably would’ve had some kind of postpartum blues because of the way I am but I didnt! So I know it works! I recommend Trisha to anyone that wants to experience a really experienced, really nice and soft spoken, down to earth woman she’s just the one! Next time I get pregnant I’m calling her and I’m putting all my faith into her because she is absolutely trust worthy. She will provide you with the knowledge and comfort you will need to experience the best enjoyable time of your life! First of all I will suggest that if you plan to have a birth with no epidural get a doula. It is worth the investment. If I had not had a doula probably I would had done the epidural and panic. Second, in my opinion Trisha’s strongest quality is that she has a strong presence and transmits confidence. This made me feel safe and supported during my labor. Third, she comes with a lot of experience. We gave birth at UCSD and she knew the nurse and she had been in births with several of the midwives at UCSD hillcrest. She knew also her way around the hospital. During my son’s birth there was a moment when I felt that the baby was coming and we were waiting for the midwife to arrive. At that moment the nurse entered and when Trisha said hi to her, Trisha told me: ” Don’t worry, if the baby comes now, this is the best nurse, I know her, she can assist the delivery, she is like a midwife” What a great gift, that our doula knew the nurse and had seen her work before. I cannot tell you how reassuring was to hear this comment when I was about to panic. Trisha also reminded me to keep focused and reminded me to listen to my husband when I was nervous. She asked the nurse to bring a cd player for my music, she asked for everything I needed and she met us on time. She was also available on the phone and we talked and texted several times the week before the birth. In fact, her advice helped me to relax and get into labor. We also took a class with her at Best Start, even though we did not delivered there and she knows her stuff! She gave us several tips to use during labor and for the weeks before labor. She knows what she is talking about and her advice was very helpful to get ready for labor. If you are considering her, interview her and see if you connect with her. She was recommended to us by a friend of us who used her services twice. She also did our placenta encapsulation and it was worth every penny. The capsules felt like a shot of energy, I had a lot of milk and no postpartum depression. I will be forever grateful because Trisha supported me in having an amazing birth and this is a memory that I will always treasure. Finally getting long enough naps to write a review. We can’t say enough good things about Trisha. She was so helpful and quick. She did our placenta encapsulation and brought them to us. She made the whole process really easy. She truly loves what she does. Trisha, IS the most amazing doula in the market. She was my doula for each of my THREE children, and all three birth experiences are different and awesome in their own way because she had a huge part of it. If you’re a first-time Mom, Trisha is a must-have because she will be your spoke-person when the time comes that you are no longer able to make any sense of your surrounding. How blessed am I to have her during my first birth (transported at the hospital via ambulance after lack of progress from the birth center). I was so scared because I did not expect to birth at the hospital, let alone, be stuck at 6cm. 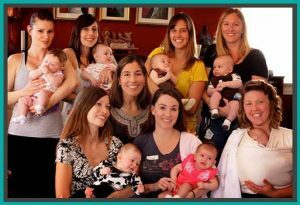 Trisha helped me get my composure together and with her expertise, I was able to birth naturally (the way I have hoped and planned to be) without epidural. I cannot believe that I was able to go through such strong contractions (I had to get induced to progress my labor) but with Trisha on my side, anything, and everything is possible! Trisha has such a kind heart, you won’t go wrong in choosing her as your doula. She is not only very educated with the birthing process and lactation, she is also very warm and trustworthy, which are very important qualities when you’re looking for a doula. My second birth with Trisha was amazing as well, it was the first time that I had my placenta encapsulated. Trisha made sure I had my precious capsules just in time for me to go back to nursing school (3 days post-partum). Those placenta capsules are amazing! It’s what gave me energy to resume clinicals and take care of my toddler and my new baby, plenty of milk to pump during the day and nurse at night, NO post-partum blues, and light on bleeding. I cannot express my gratitude enough for Trisha for accommodating my placenta the third time I gave birth (6 weeks ago). Without these amazing pills, I would not have passed my boards and become an RN, BSN at five weeks post-partum! Trisha is not just a doula, she is also a friend and a mentor 🙂 So if you’re looking for the best package around, hire Trisha and you won’t regret! If you need further reference, I would be more than happy to talk to you and your partner about Trisha’s amazing abilities. I absolutely recommend Trisha! She is incredible! Her experience speaks for itself & we instantly felt that she was someone we could fully trust to help us through the delivery of our first baby. On each of our at-home visits with Trisha she educated us, gave us an opportunity to ask questions, and helped us feel very comfortable with our birth plan. She also gave me a refreshing peppermint foot bath & foot massage – pure heaven when you’re 38 weeks pregnant! I called her quite a few times – as I was a very nervous first time mom – and she took all my questions and concerns very seriously and was always able to put my mind at ease. Each interaction we had with her before our birth – completely affirmed that Trisha was the best choice for us! Unfortunately, our birth did not go according to plan, and thank God we had Trisha – we just would not have made it through our 49 hour labor without her! We were exhausted, frustrated, and disappointed…and were just so thankful that she was there to give us emotional support and be the calm in the storm that we very much needed. She was able to guide us & give us clear information to help us understand what was going on so that we could make the best decisions for our baby. And I’m so pleased to report that we have a very happy, healthy baby boy! Trisha did a wonderful job with encapsulating my placenta in June 2011. She came to my house only twice with her own equipment and left everything cleaner than when she came. While things were “cooking,” she talked with me and volunteered to watch the baby while I took a nap. Trisha then left me with two jars full of capsules complete with dosage instructions. The whole thing required no energy on my part and all I had to do was be home. I’ll be using her again next time! I wish to write this testimonial in order to let others know what a great experience I had. This past June I had my first child and decided to have my placenta encapsulated. I am very happy I found Trisha for many reasons. First, she was able to schedule a visit to my home promptly — my daughter was born Friday and Trisha came Saturday. She came organized and ready to handle business: she transports everything in a large, rolling suitcase which meant she didn’t even need a hand! Beforehand, she let us know that she had everything but I didn’t realize that when she said everything she meant everything. When she was cleaning up afterward, she even used her own sponge and cleaning supplies! I was pleasantly surprised when I saw this. I think she left our kitchen cleaner than it was when she arrived. She provided constant communication during the process and while she was away from our home (process takes two days). Finally, the packaging for my pills was very cute and professional. I will be doing this again after each of my future children and am certain I will be calling Trisha.